A Ferrari 312B3-74 was roaring down the street in front of me, its 3-litre flat-12 engine causing the air to echo with a melody so loud, but so beautiful, that it made me want to find the nearest tattoo parlour and get the words "naturally aspirated" inked forever on my forearm. Fortunately, better sense prevailed, and I decided I had best figure out how on earth I'd stepped through a time portal and ended up in 1974 to begin with. After all, there was simply no other explanation for the fact that I'd just seen that bright red No.12 Ferrari blaze down the streets of Monaco, chased closely, I might add, by a Williams FX3B/FW03. Time travel, it must be. That Ferrari 312B3 is hurtling down towards La Rascasse in 2018 and not 1974! So, I picked my mandible up off the ground that it had hit so inelegantly, forced my eyeballs back into their sockets, and headed down towards La Rascasse for another glimpse of the cars. The way I saw it, if I had already found myself in the past, that too in an era of motorsport to which I firmly believed that I belonged, I was going to enjoy myself thoroughly. Along the way, if I spotted young Niki Lauda somewhere, I would tell him that I'd just seen someone run off with his car. Some chappie named Maximilian Werner, according to the entry list I'd managed to get my hands on. 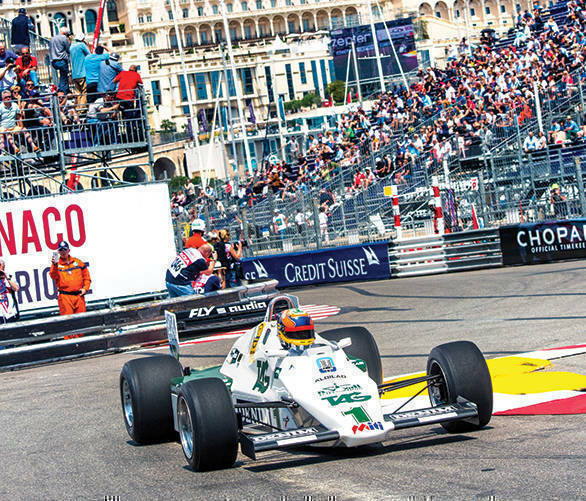 Once at the infamous Rascasse corner, I found nearly no place to stand at all, thanks to the crowd of people who were salivating at the racecars that were going past them. But along the way, I'd had a chance to discover that Monte Carlo, with the Grand Prix de Monaco Historique raging on, was very different indeed. The world had gone technicolour - the reds were redder, the yellows could have put the brightest of canaries to shame, and the blues and greens weren't mere blues and greens. Instead they were emeralds and cyans seemingly squeezed right out of tubes of Old Hollands Classic Oil Colours. It was as if the pages of old Formula 1 encyclopedias had come right to life. There were none of the muted colours or tones of today, nor those tiny bits and bobs and winglets. Instead there were large expanses of metal, painted very bright, that were blitzing around a grand prix circuit as fast as they could. No sitting around in museums with a coat of wax on them for these machines. No, these were racecars doing what they were meant to do - go racing. At a place they were meant to do it - glorious Monte Carlo. 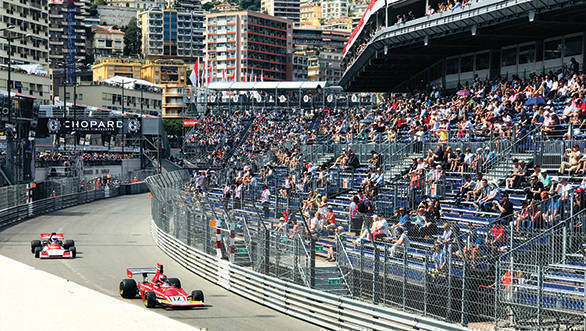 What Florence, in all its Stendhal Syndrome-inducing glory, is to the world of art and culture, Monte Carlo, with its historic racecars, is to the motorsport world. It is the capital, the nerve centre, the hub, the focal point. It is where it's at. There's no two ways about it. I was to discover just how crazy and bizarre it all could possibly get when I encountered the RofGo Racing team. RofGo, stands for Roald Goethe, a businessman and gentleman driver, who enjoys his racing cars. Not just any racing cars, specifically Gulf-liveried racing cars. See, the story goes that when Roald was a little boy he'd seen the Ford GT40 in Gulf colours, fallen in love with it, and showered much affection on a scale model of the machine. He'd decided that someday, if he could, he'd buy himself a Gulf-liveried GT40. A childhood fantasy that a lot of us have, then. Except that unlike you and I, Roald's actually gone and done it. His private car collection reads like the racecar-equivalent of the Time's 100 most powerful people in the world list. 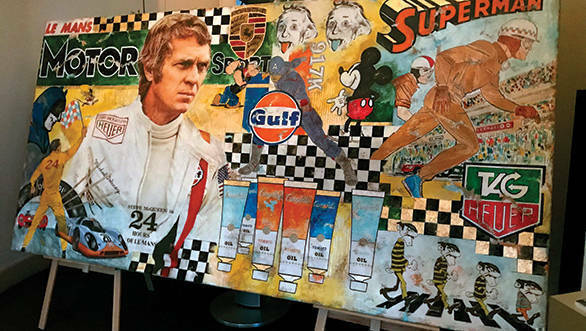 Not only does he have a GT40, but he's managed to add the Gulf-liveried Porsche 917, the Porsche 908, the Aston Martin DBR9, the Le Mans-winning Mirage GR8, and even the 1967 Mercedes transporter in which the Gulf Porsches were ferried to and from Le Mans. The RofGo collection, which boasts of approximately 33 cars, carefully curated for Roald by Adrian Hamilton, car dealer extraordinaire, is the largest collection of Gulf-liveried race machines in the world. And, I haven't even gotten to the crazy part yet. Remember how I'd said something about these racecars not just sitting around in museums once they get to Monte Carlo? 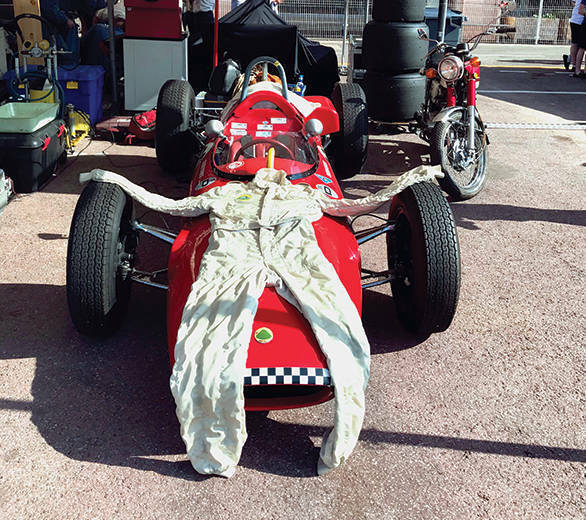 At the 2018 Monaco Grand Prix historic, among the many machines RofGo Racing had brought over, were three that they had every intention of racing hard. One was a 1973 McLaren M23, raced by Stuart Hall, whose accomplishments include being part of the Aston Martin Racing GTE-Am team that took the class title at the 2013 World Endurance Championship. 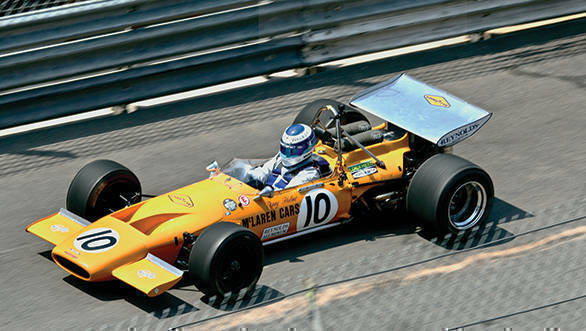 More recently, in a McLaren M19A (that he was racing in 2018 as well), Hall took victory at the 2016 Historic Monaco Grand Prix. As I walked around the street circuit at Monte Carlo, Hall had just managed to set the outright lap record for a historic Formula 1 car at the circuit. He was the talk of the town. 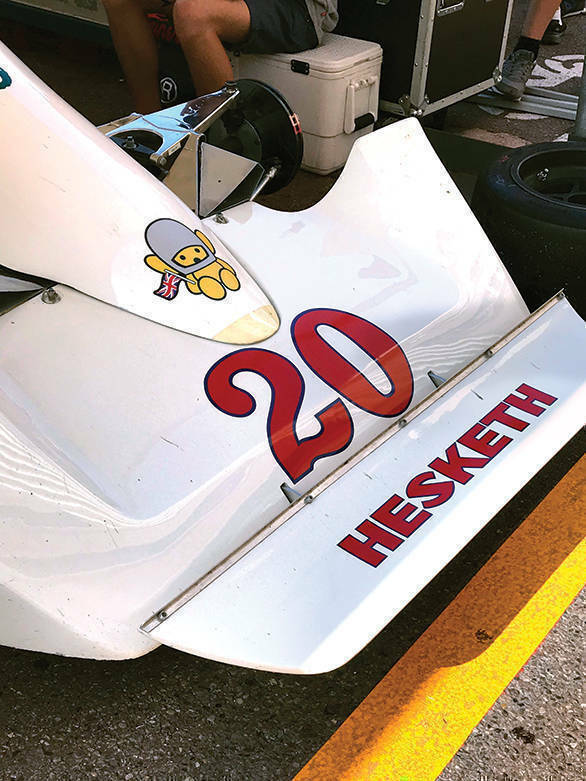 Impossible to spot the Hesketh Superbear logo and not snap a photo of it! Every single time someone realised that I was a journalist, potentially writing about the event and the team, I was asked, "Spoken to Stuart yet?". But Hall, like those rare racecars that you might be lucky to see once in a lifetime, was elusive. Either he was off to analyse video footage of his practice and qualifying laps, or he was thinking of heading back early to get a couple of laps in the simulator before he could count himself truly prepared for the race. See, this might have been historic racing, but there was no going easy on the drivers or the machines. There was just pure flat-out racing in cars that were very, very valuable. It's like going and dropping 100,000 USD on a first edition of The Wizard of Oz and actually reading that very copy! But there was a rarer and more intriguing machine that the team had brought to Monte Carlo. 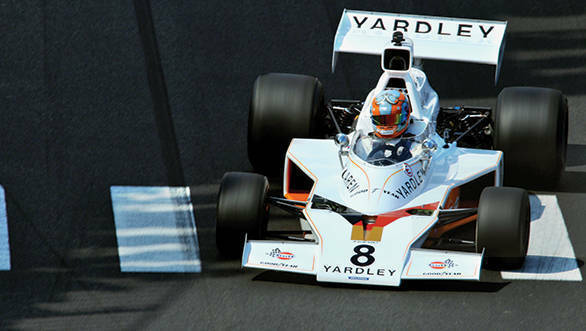 The only Gulf-liveried machine to have raced in Formula 1. Back in 1976, for four brief races, Alessandro Pesenti-Rossi drove a Scuderia Gulf Rondini Tyrrell 007 in Formula 1. He took part in the German, Austrian, Dutch and Italian grands prix, with a best finish of 11th at the Osterreichring. Think of the Derek Gardner-designed Tyrrells and you'll immediately think of the blue-and-white 007s with "Elf" emblazoned on the side, and maybe the six-wheeled P34s. Even Karun Chandhok, that most anorak of all racing drivers, who I found driving Keke Rosberg's 1983 Monaco GP-winning Williams FW08C in Monte Carlo, was stumped by the fact that he couldn't recall such a machine. It was a machine so rare that Roald Goethe decided he'd race it himself, as he has every right to, seeing as he owns the thing. As things would turn out though, he'd also crash that very rare machine during the race. Fortunately, for the RofGo team though, they'd managed to take home some silverware courtesy Stuart Hall who'd finished second in the Series F race in the McLaren M23, and second also in the Series E race in the McLaren M19A. 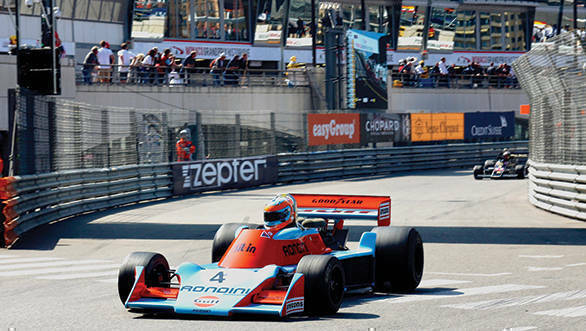 For me though, it really was the Gulf Tyrrell 007 that was the highlight of the RofGo machines I'd seen at Monaco. To me, it was what the Jerdon's Courser was to the world of ornithology - it's all very well for people to say it still exists, but seeing is believing. 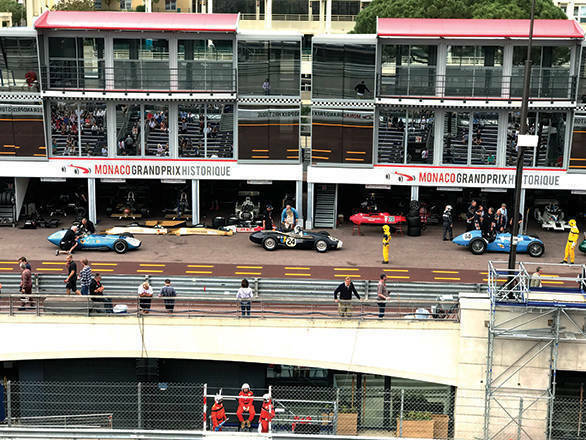 If I've managed to give you the impression that the Historic Monaco Grand Prix is only of interest to people who have a particular fondness for 1970s F1, I must at once begin to set the record straight. This historic racing festival is an extravaganza of epic proportions for absolutely all motorsport fans, no matter which era of racing they might be interested in. From pre-war grand prix cars like the Bugatti Type 35C and the Era R5B, to Maserati 250Fs and Ferrari 246 "Dino"s, to the Brabham BT11s and the Lola Mk4s of the 1960s, it's all there. Not to mention the fact that you'll find everyone from Thierry Boutsen, to Derek Bell (who chatted with us for a feature you can read on Page 208), to Mika Hakkinen, to Eddie Irvine, to Ricardo Patrese, driving, if not racing there. 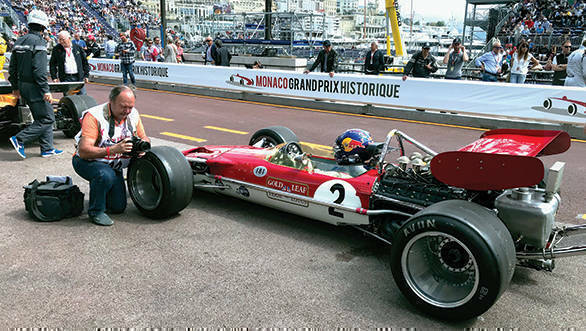 And you might even spot the likes of Adrian Newey playing hooky from tech duties for Red Bull Racing at the Spanish GP, and driving a lovely Gold Leaf Lotus 49B (once driven by the legendary Graham Hill) at Monte Carlo. That's just the sort of draw that the Historic Monaco GP has. It's the motorsport flame to which racecar enthusiasts are drawn like moths. 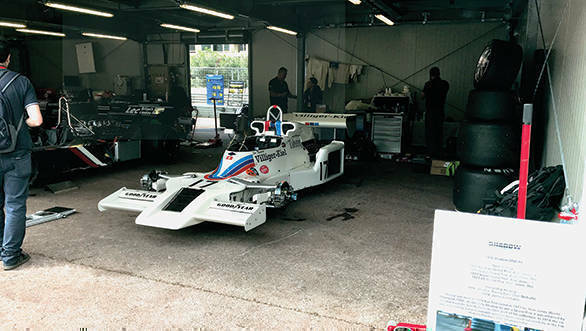 If you can make your way into the support paddock, you might even find the time to have a closer look at these machines and get in a quick conversation with the people who own and race them. Along the way, you'll truly feel like you've been transported back in time to a simpler era. Where the people were friendly, the engines were raucous and loud, the colours were bright, and the racing was so very close! And if you're truly lucky, like I was, you won't just get to see a Monaco Grand Prix from eras past. You might even get to see a wet Monaco Grand Prix. Fortunately for you, I have a little tip as to how you might be able to witness this wondrous event yourself. Word is that the portal is set to open next between May 8th and 10th, 2020. Time aplenty to get yourself ready, then. I'd recommend that you take a camera, some earplugs, and a very large drool bib.